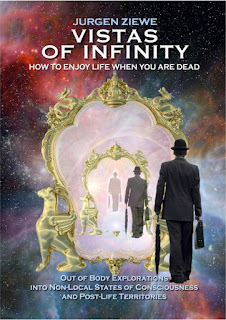 Today I'm reviewing the book Vistas of Infinity by Jurgen Ziewe. If you read my blog, you may already know that Jurgen Ziewe wrote my favorite OBE book, Multidimensional Man (MM) and its sequel The Ten Minute Moment. You may also realize that it's been a long time since I've posted an OBE book review. That's because I wanted to read this book slowly, a little at a time, savoring each sentence. Consequently, this book review is a bit long winded. The book covers a lot, so I have a lot to say about it; sorry! This book is about the author's further explorations into the non-physical realms, afterlife territories, and cosmic consciousness. It's a natural progression from Multidimensional Man (aka MM) explaining where the author has gone and what he's witnessed firsthand (mostly) since the first book was published. This book builds on and complements the first two books perfectly. "1. I had to have full waking Consciousness while out of my body. 2. I had to be fully aware that my physical body was in another place. 3. I had to have full awareness of my waking life's social identity. 4. I had to be fully aware that the experience was not even part of a lucid dream, let alone a dream." (pp 11-12). Although he doesn't describe the techniques themselves, he does describe the procedures or meditations he used to induce each OBE, whether it started as a lucid dream, a meditation or other induction technique. He goes beyond normal reporting of what he saw: he advances some theories as to how the multidimensional reality works and its structure. He compares and contrasts his observations with the few historic reports of higher (beyond the astral) states of consciousness, such as Theosophists like author C.W. Leadbeater. He describes OBE encounters with alien life forms, which is rare in the literature (also see Darryl Berry's book). He also talks about his "Silent Companion" and where that's led him. This perfectly fits what I call my "inner voice." I've always maintained that experience and knowledge trump belief and faith, and OBEs can provide direct experience that religions only hint at. Ziewe is unafraid to challenge religious dogma (and not just Christian) with direct experience. In his latest adventures, he separates fact from fiction with regard to karma, and visits many of the places people go after they die. This includes places most Christians would be quick to call "Heaven" and "Hell," even if they are still on the Astral Plane. He also talks about encounters with the dead, including his own deceased mother, which is very interesting. His OBEs also go far beyond the Astral Plane to some hard-to-reach places, Heaven-like worlds that some would describe as higher planes of existence. To do that, he had to abandon all concepts of "self." "Getting into these levels beyond the Astral is an undertaking that requires a mindset free of all its previous identification and attachments. It is simply impossible to enter this state still connected to any of our cherished fixations of self-importance. If we are not prepared to do that, it would be like attempting a balloon ride with all the heavy weights and ropes keeping it anchored to the ground." (pg. 194). "Sometimes it is possible to approach these elevated regions from the air during OBEs and they show themselves up first as a bright light in the distance, like dawn breaking in the morning. As we get closer, we find increasing discomfort when facing these brighter territories until we get acclimatised. This is another reason why I found it hard to accept that dimensional levels are in some way stacked vertically on top of each other. Although we can enter higher dimensions via a shift in Consciousness, we can also literally travel towards them." (pg. 186). Another thing that struck me when reading this book is how some of his experiences matched the movie Astral City, both in the scenery and the people he encountered. "Consciousness was clearly showing me that my physical life was just a small part of many other life experiences and that, at night, possibly in deep dream state, or even parallel to my waking state, I had been busy pursuing one or more alternative existences. With this thought, I sank into a semi-meditative state and I began to remember more and more detail with astonishing clarity; I gained the realization that the life I am leading back in my physical body is only the tip of the iceberg, one of many lives I am leading - or, perhaps better, Consciousness is leading - each one of equal significance." (pg. 169). So what is at the core of Consciousness when you drill down deep enough? If Multidimensional Man left you hungry for more, Vistas of Infinity will satisfy you, but please read MM first. MM is still at the top of my OBE book list, but only because it touched on some nerves that actually made me cry. More than once. (I did not cry for Vistas of Infinity.) Nonetheless, Vistas transformed me as I read it. Somehow it brought about subtle changes in my awareness. I feel like a different person; more authentic, more connected. It's like an old friend has been whispering in my ear, reminding me who I am; who I want to be, who I can choose to be again. I can't promise it will do the same for you, but it has that potential. The book's content and length are both good: it has both quantity and quality. The grammar is flawless. The presentation is professional and the writing is eloquent. Thank you, Bob as always for your reviews. You helped me a lot in understanding many of of the OBE insights that escaped me in the past. So lucky to have met you and your wonderful wife at OBE Intensive course last year in TMI. I must say, out of all of the books you've reviewed, Jurgen Ziewe's Multidimensional Man and Vistas of Infinity are the ones that really made me feel something wondrous, even by reading only quotes you've selected. Did you know you can create short urls with LinkShrink and make $$$$$ for every visitor to your shortened urls.